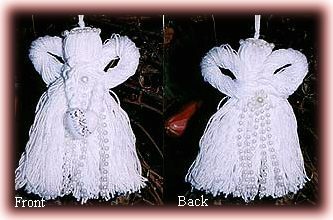 Craft some pretty winter white angels from crochet cotton formed into tassels with braided wings. Wrap crochet cotton around a four inch cardboard square about 150 times. Cut a small piece of cotton string, feed one end under your layer of cotton and tie a secure knot to hold your cotton strands together (diagram 1). Gently pull the strands off of the cardboard square. Place scissors inside the loop and cut through all strands (diagram 2). You have something that looks like diagram 3 below. Shake out all the strands, so they are all straight and wrap a piece of cotton around the top section and tie a secure knot. This will create the tassel shape. Trim away any uneven strands at the bottom of your tassel. Wrap cotton around your three inch piece of cardboard as before, about 75 times. This will be the wings. Carefully pull the strands off the cardboard, keeping one finger at each end of the loop. You do not want all the strands to come together. Once you have the strands off the cardboard, twist the loop into a figure 8 shape and tie a piece of cotton around the centre (diagram 5), keeping the figure 8 shape. For the arms, I braided the cotton to create a length that measures about 4 inches when completely braided. This is a little more difficult to do, but with some little hands holding one end, while you braid, you will have it done in no time at all. You only need about 12 strands of cotton for this braid, dividing your strands into 3 sections of 4 strands to create your braid. Tie each end of your braid with a small piece of chrochet cotton to keep it secure (diagram 6). Now you need to glue all the pieces together. Glue the arm centre to the back centre neck area. Glue the wings on top of the arms at the back and add a couple of dots of glue to the wings in order to help them retain the sideways 8 shape. Pull the arms to the front and glue a decorative button or bead to the hands. Be sure that glue touches both of the hands and the button. Glue a small circle of pearl strand to the head for a halo and a few strands to the button back and at the centre of the wings on the back of the angel.